What to keep in mind when installing microwave RF shielding - avoid the three most common mistakes! 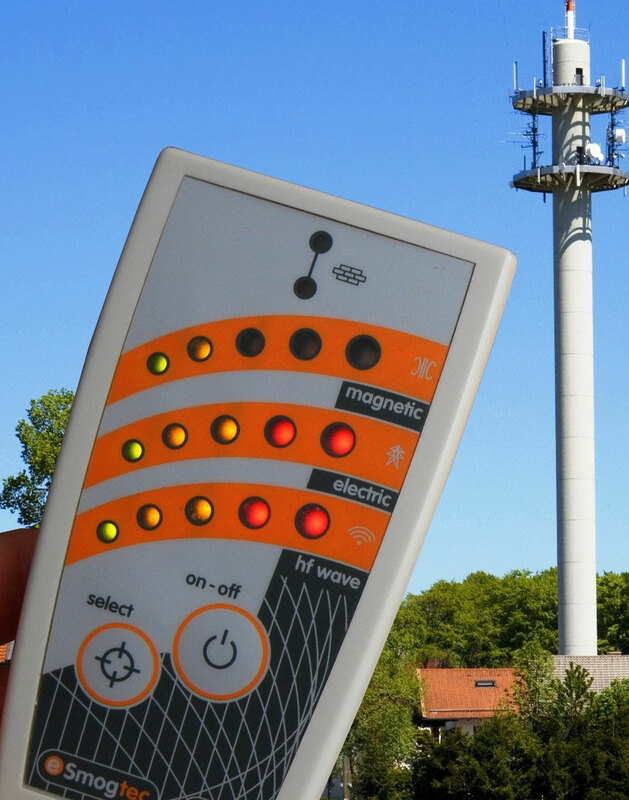 Here are three important points you need to keep in mind if you want to successfully shield microwave RF radiation e. g. from a cell phone tower! Over the years I have seen many successful shielding projects completed, and a few that went wrong and left customers unsatisfied. I have identified three main causes for shielding projects that did not fulfill the customers' expectations, and here I want to share this knowledge with you. 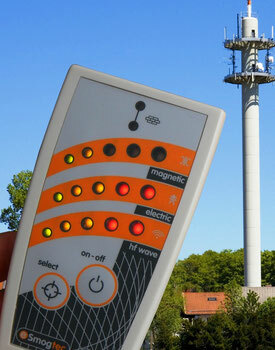 esi 24 emf detector showing high values of microwave radiation near a cell phone and radio tower. To measure your actual high-frequency (HF) / RF (radio frequency) / electromagnetic radiation / microwave radiation exposure after installing the shielding may sound like a no-brainer, but it is most definitely not. Sometimes shielding is installed according to visual clues without measuring actual electromagnetic radiation exposure. Let's say you have a cell phone tower on one side of your bedroom, and you shield the wall and windows towards this tower. This may be a good idea if a main beam of that cell phone tower horizontally hits your bedroom. But there is always the possibility that the cell tower you see is not the major problem, but that the neighbors Wi-Fi, which you do not see but which is sitting right behind the other wall, is actually hitting you full force 24 hours a day. Buy the amazingly easy to use esi 24 emf detector to assess your personal EMF exposure! More information and technical details for the esi 24 emf detector here! Canopy made from Swiss Shield shielding fabric protecting child from elevated levels of electromagnetic radiation. Why are low frequency electric fields important to keep in mind when you do HF - microwave shielding? All microwave reflecting materials used for shielding have an electrically conductive component. The conductive material can e. g. be carbon or metals like silver and copper, but there is always a conductive component in every HF reflecting shielding product. These conductive components can pick up and propagate low frequency electric fields emitted by the electrical installation, but also coming from power strips, extension cords and electrical appliances. And those electric fields are there whether power is consumed or not, so they are there 24 hours a day. 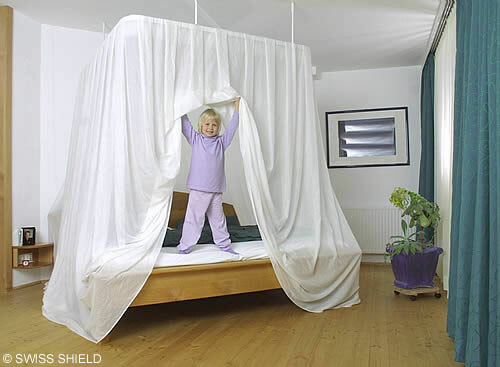 If we assume that the bed with the canopy in the picture is sitting on a wooden floor construction, then the bed will practically sit on the wiring for the light in the ceiling of the apartment below. The conductive components in the fabric of the canopy may pick up the electric fields from those wires and propagate them. Chances are, if you are sensitive and you feel worse after shielding material is installed and the HF radiation is in fact lower than before the shielding, that you are exposed to low frequency electric fields and your body is reacting to them. If you feel worse after shielding has been installed, how can you check if low frequency fields are the problem? When it comes to measuring low frequency electric fields, I am a big fan of body voltage measurements. This will give you a very clear picture of the amount of low frequency electric fields you are exposed to. And the good news is that there are very inexpensive body voltage measuring kits out there, or if you are experienced with electrical equipment you can simply use a voltmeter or multi-meter from the Do-it-yourself store to measure body voltage. Keep in mind that if you are a healthy, robust individual those low-frequency electric fields will likely not bother you, even if you are exposed to them over longer periods of time. But if you think you react to electromagnetic fields (EMF), then the body voltage meter may be the most important tool for you in order to start feeling better. I personally need less than 10 millivolt of body voltage to sleep well. If body voltage readings are in the 200 or 300 millivolt range I start getting irritable and I behave more aggressively. Check out the German SBM Buildings Biology standard body voltage guidelines here: SBM buildings biology exposure guidelines (Category A 1- AC ELECTRIC FIELDS). One last word of advice: regular low-frequency meters are in my opinion not a good choice to measure your low-frequency electric field exposure when you are sensitive, because you need to measure those fields in all three directions and everywhere where your body can pick up electric fields when you are asleep. In my opinion a body voltage meter is the better option if you are sensitive, and it is much easier to operate. Low-frequency meters will help you to locate the sources of electric fields, they have their place there, and they are good tools for the workplace. But in the bedroom, where you want really low exposure while you are sleeping and your body is regenerating, the body voltage meter is my weapon of choice. Buy a body voltage measuring kit here now! Dirty electricity (DE) are unwanted frequencies on the power grid and on the home wiring. Those frequencies radiate from the wiring into the surrounding space, e g. your bedroom or living room. Dirty electricity is mainly caused by low-energy electromagnetic pulses which are generated by appliances with electronic controls like CFLs (energy-saving lights), system control equipment, power supply units etc. 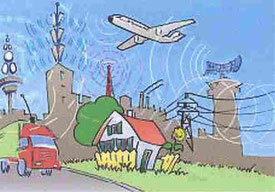 Usually frequencies from 10 kHz to 50 kHz are investigated, but there are lower and higher DE frequencies. However the low kHz range is considered to be the most biologically active one, meaning it may be responsible for health effects in living organisms. Now if you look at the picture on the left, you have a couple of cell phone antennas and a radio link antenna on the bottom of the far right antenna pole. I personally suspect that the health problems experienced by people living under cell phone towers are not only caused by increased microwave radiation, but that Dirty Electricity produced by the systems control equipment of the various antennas is at least a contributing factor. 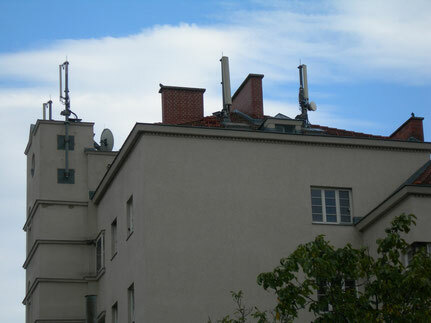 If you consider the situation in the picture you can imagine that a lot of control equipment will be necessary to operate and adjust the various antennas, and that all this equipment may produce quite significant amounts of DE signals which will be propagated by the wiring of the building, and from there radiate into living spaces. If you want to learn more about Dirty Electricity here is a download. My assumption that DE can contribute to health problems experienced by people living below cell phone towers is in my opinion supported by a new study from Japan, where people reported a reduction in health problems after cell phone towers were removed from the roof of their apartment building (Tetsuharu Shinjyo, MD and A Shinjyo, Recovery of Residents’ Health Following the Removal of a Mobile Phone Base Station from the Roof of a Condominium Building - A Follow Up, Okinawa, Japan, 2014). The interesting thing about this study is that the adverse health effects (which disappeared after deinstallation of the cell phone antennas) were reported at very low microwave radiation levels of 20 microwatts per square meter and below. In my opinion there are two explanations for this: 1) Either exposed subjects really did experience health problems due to very low HF exposure levels; or 2) other (not recorded) environmental stressors were involved in creating the health problems reported. And here DE is my first suspect, as DE levels throughout the building may have declined significantly upon removal of the cell phone towers on the roof, helping people to recover. What you can do to make sure that DE does not affect you is to get a DE monitor, which will give you a good idea of the amount of Dirty Electricity you are exposed to in your living quarters. Fortunately, the monitors are inexpensive and easy to operate. What you need to do is unplug all your own appliances, and see how much DE actually enters your place on the grid from the outside. Because with DE it is as with microwaves or with low frequency electric fields, that very often we cause a large portion of the EMF we are exposed to ourselves, often unknowingly. Buy a Dirty Electricity monitor now and check Dirty Electricity on your home wiring! One last thing: regular low frequency meters will usually not measure DE signals even if the suppliers claim they do. The wave form of DE is too different from the sinus-like wave forms of regular low frequency electric fields and harmonics. So even if the frequency range is right, there will usually be false negatives when using regular low frequency meters. Only other way to make sure there are no DE signals will be an oscilloscope. Some expensive spectrum analyzers indeed do measure DE, but they are not feasible for private use, and complicated to operate. So the DE monitor is in my opinion a good and well priced solution for DE assessment. New article: The boiling frog syndrome - or why "Oh, I am not doing so bad!" is not nearly good enough. Several cell phone antenna poles with 2G/GSM, 3G/UMTS and 4G/LTE mobile phone antennas on apartment buildings. Also notice the round white point-to-point radio / directional radio / radio link antennas on the bottom of the far right antenna pole. Electromagnetic radiation is also known as radio wave and microwave radiation, high-frequency (HF) radiation, RF (radio frequency), high-frequency electromagnetic fields (HF-EMF). Frequency range of electromagnetic radiation: from about 30 kHz = 30,000 Hertz up to the lower infrared light frequencies, which start from 300 GHz = 300 Gigahertz.